The story behind how a team of Archaeologists and Quaternary scientists got together and found that Mesolithic people living at Star Carr 11,000 years ago, were resilient to abrupt climate change. Star Carr is a famous site in the archaeological world because of the incredible array of finds found hidden for 11,000 years below a metre of peat. It was first discovered in the late 1940s by an amateur archaeologist who had found bone and flint poking out of the side of a ditch. 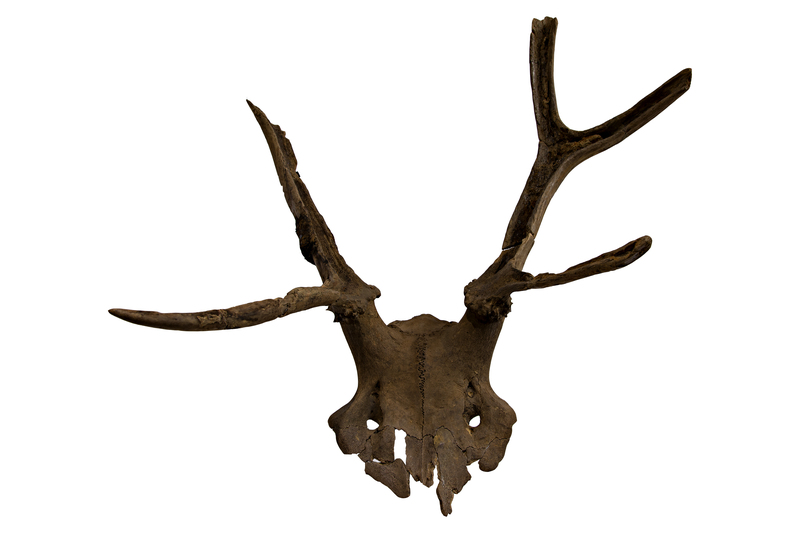 It was then excavated for three years by Grahame Clark of the University of Cambridge who uncovered large numbers of animal bone and rare artefacts such as antler barbed points, amber and shale beads, and 21 antler headdresses made from red deer skulls (no others have been found in Britain and only a few are known in Europe). The site was briefly investigated again in the 1980s by the Vale of Pickering Research Trust and evidence of the earliest carpentry in Europe was unearthed, in the form of a timber platform. From the mid-1990s, Chantal Conneller, Nicky Milner and Barry Taylor had been working with Tim Schadla-Hall and the Vale of Pickering Research Trust, looking for other sites in the area. It was known that Star Carr had been located on the edge of a lake and the lake margins were also located by augering and measuring the depth of the peat to create a contour map. It had always been our dream to dig at Star Carr and we couldn’t believe our luck when we were given permission to start work on that site from 2004. The excavations started out small but in 2008, on excavating on the dry land part of the site we found evidence of a structure: the earliest house in Britain. 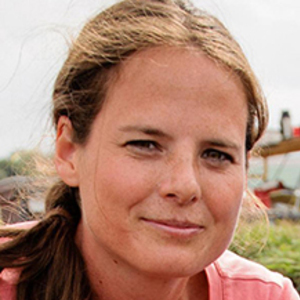 Chantal, had heard Simon Blockley give a talk about tephra dating, and invited him to visit site in 2009. Simon and some of his colleagues visited to sample for tephra deposits. It soon became clear that the sediments which had infilled the lake, had huge potential for reconstructing environmental and climate records and Simon was able to bring in the expertise of a team of researchers from the Centre for Quaternary Research in the Royal Holloway Geography department and the University of Southampton. 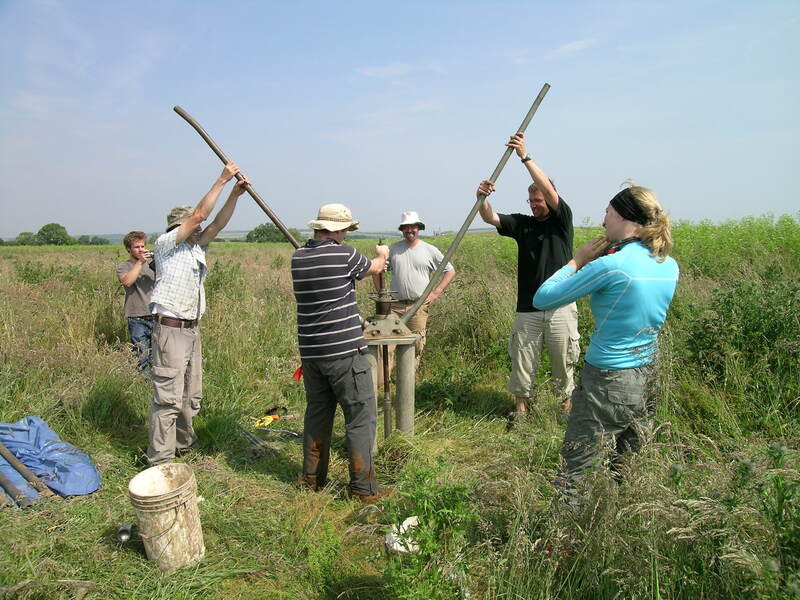 Understanding the environmental context of sites like Star Carr has been a core goal in Mesolithic archaeology for many decades, but it is only recently that our understanding of the abrupt nature of climate change has impacted on archaeological interpretations. Often, in order to explore the influence of climate on human populations in prehistory, we have to compare archaeological evidence with climate data from long ice cores taken from Greenland. Whilst incredibly detailed and useful, these records tell us about climate in Greenland, and not what was actually happening where the human groups lived. We were therefore very excited to be able to work here because we could reconstruct past climate from a location where people had been living. On top of this, as the Star Carr people were living on the lake edge, we could also work on both lake edge and deep lake cores which gave us the distinct advantage of using major biological changes, such as regional pollen markers, to tie the lacustrine climate record directly into the archaeological chronology. The combined archaeological and palaeoenvironmental project has taken years to bring to fruition. The archaeological excavations started small but in 2012 we received European Research Council funding which meant we had the resources to employ a team of specialists and open up large trenches. 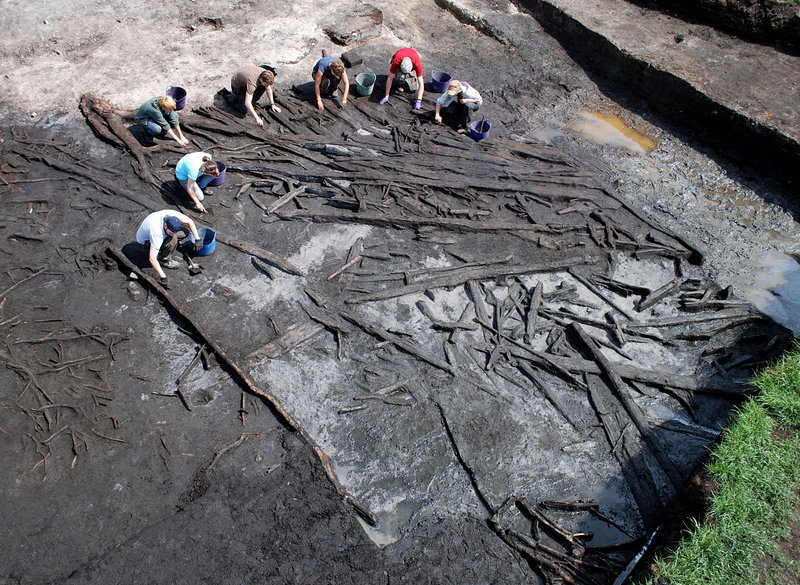 This produced amazing results, revealing three large scale timber platforms on the lake edge, more house structures on the dry land, and intriguing dumps of bone and artefacts into the shallow waters of the lake, including more antler headdresses. We were also lucky enough to work with Alex Bayliss of Historic England who dated many more samples for us, funded by Historic England, and modelled them. 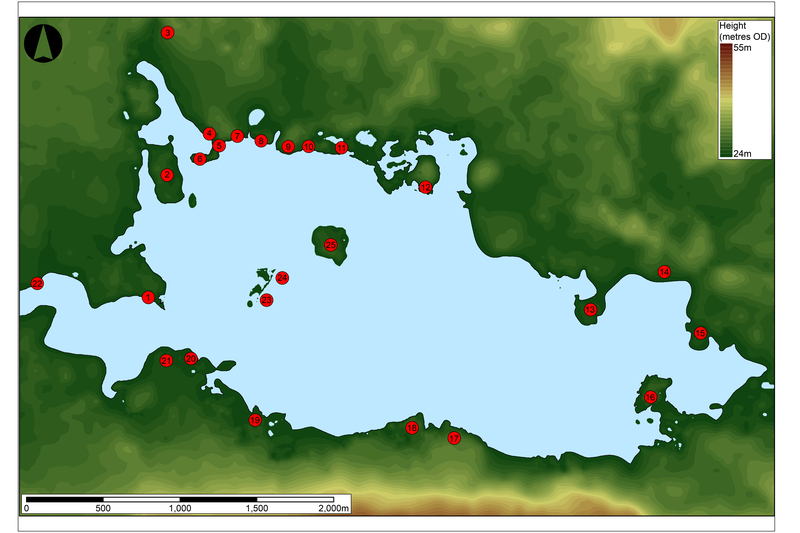 This demonstrated that the site was occupied for about 800 years and produced a chronology for the platforms, dry land structures and depositions in the lake. On the climate side we first had to work out the best lake records to work with and what was happening with the lake itself. This has required many tens of boreholes to be taken, as it turns out the lake story is quite complex. We found in the first few seasons that the stratigraphy of our cores changed significantly as you moved around the former lake basin. In fact coring just a few metres apart could mean cores would hit basal gravel at depths of 5 metres or so or over 8 metres. Some of the cores just seemed to contain marl (implying warm environments) while others had a mix of marl (warm) and clay (cold). 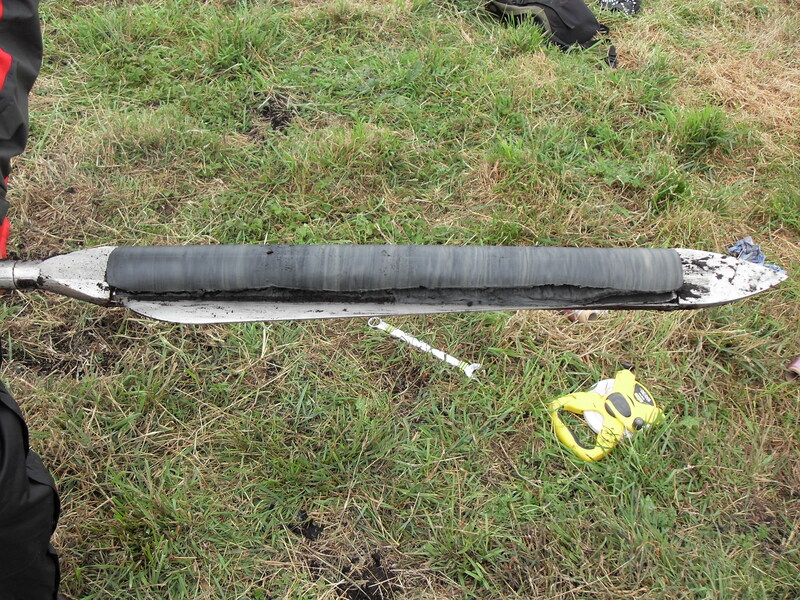 In order to understand the record properly we undertook a large borehole survey (Palmer et al. 2015) that revealed an undulating topography in the lake sediments hidden bellow the agricultural land that is now home to Star Carr and its former lake environs. In fact the lake formed in dead ice features left behind when ice retreated back from this area after a period known as the Last Glacial Maximum and the deepest lake cores record the fluctuating pattern of climatic and environmental change from this point (around 16,000 years ago) up until the lake shallowed out and became fen carr around 10,000 years ago. Of particular interest for us was the excellent record of the transition out of the last ice age and a series of environmental fluctuations in climate that covered the first few centuries of our current Interglacial, the Holocene – exactly the period of time the archaeological chronology said people were at Star Carr. We then undertook a very detailed and high resolution set of analyses to reconstruct climate and environment, using a range of chemical and biological techniques. It was very exciting to see these results come through as it was exactly the kind of data we wanted. At a joint meeting of the archaeological and environmental team we went through the combined data sets to test for any link between changes in the archaeology and climate shifts we had detected in the lake cores. At least some of us were definitely expecting to see the influence of the climate transitions on the human populations, as there is an increasing literature suggesting Early Holocene climate events were critical drivers of change. In fact we found no influence and an amazing resilience to climate among the Star Carr population. This result was quite astounding as we knew there were climate shifts of several degrees of annual cooling, big enough to change the local environment but they had no influence on the Star Carr residents. These early Holocene pioneering populations were building house and lake structures, depositing the headdresses that are an iconic feature of the site and continuing their lifeways before, during and after our climate shift. For us, this went directly against a growing narrative of climate as a driver of change in many archaeological records, including ones individual team members have worked on, and shows an amazing level of resilience and adaptation to the site and environment in these populations.